At Absolute Insurance, we know that choosing the correct health insurance plan for you and your family is one of the most important decisions you make. We work hard to offer the best health insurance plans available for our clients. We strive to understand your unique situation and establish a plan that works best for you and your family. Nothing is more important than your family’s health - that’s why Absolute Insurance Agency, LLC seeks to provide you and your loved ones with a health insurance policy that’s high-quality and cost-effective from the nation’s top insurance companies. We can help you decide which health insurance plan is for you, whether it be an individual health insurance plans, group benefit plan, or medicare supplement. Individual Health Insurance is a great option if your employer does not offer group benefits. We can help you determine if you qualify for financial assistance, explain all your options, and assist you with enrollment in any individual health insurance plan, even those sold through the marketplace (Connect for Health Colorado). Group Insurance is for companies that want to provide insurance benefits to their employees. Premiums are typically paid by both the employer and the employee and coverage may be extended to eligible dependents. In many cases, group insurance will cost less AND provide better coverage than individual insurance. And the premiums can be tax deductible! If you own a business and want to offer insurance to your employees, we can help find the right plan for you. Medicare has many rules and regulations. We can help you understand your rights and responsibilities under Medicare. Give us a call to help you navigate through Medicare, Medicaid, Medicare Advantage, and Medicare Supplements. Absolute Insurance Agency is extremely knowledgeable and up to date with the continuous changes that take place in the health insurance industry. We also have a thorough understanding of the plans that are available, and can explain these plans in detail. 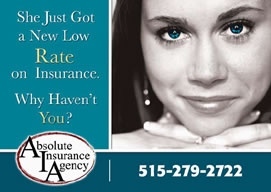 Call our insurance agents today at 515-279-2722 to inquire about health insurance for you and your family. Copayment. A copayment is a type of medical cost sharing that is usually included in most health insurance plans. It requires the insured or others that are on their plan to pay a fixed amount of money when medical services are received. The insurer will then be responsible to pay the rest of the medical charges for that particular visit. Different services may require separate copays depending on your plan. Some plans require a deductible to be met for some types of services, before the copayment applies. Deductible. 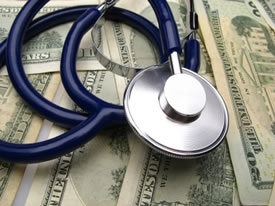 A deductible is a fixed dollar amount that must be paid in a benefit period before the insurer will begin to make payments for covered medical services. Both family and individual deductibles may apply, so it is important to read the fine print of your plan before signing up for it. Deductibles may vary if your medical provider is in network or out. Maximum Out of Pocket Expense. This is the maximum dollar amount that a plan group member will pay out of their pocket during any given year. Until the maximum amount is reached, the group members and plan insurer will share all costs of covered expenses. Once the maximum amount is reached, the insurance carrier will pay all covered expenses. To get superior health insurance that will more than meet your needs, contact us today for a quote.